Howard Berger: July 2016, I was contacted by Seth MacFarlane to come aboard the starship USS Orville to be part of the team in helping create the universe he had always imagined since he was a boy. A world that was hopeful, positive, colorful, funny and filled with adventure, as well as heaps of alien life-forms. How could I resist? This sounded like the perfect project to be a part of. 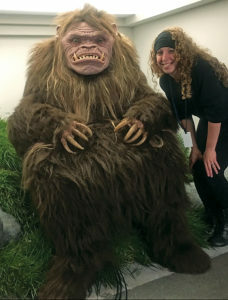 The pilot was several months away from filming, so I went to KNB EFX Group, the Special Make-up Effects Studio I co-owned with Greg Nicotero these past 30 years, to start designing the 100-plus species Seth had written about in the 13 episodes. KNB artists John Wheaton and Michael Broom began the process by design work. We found that Seth responded best to thumbnail pencil sketches instead of the polished Photoshop art we normally present. Once we landed on something he liked, we would then refine the piece for production purposes and begin the next stages of sculpting, mold making and running thousands of foam latex prosthetics. Key sculptors at KNB were Norman Cabrera, David Grasso, Andy Schoenberg, Alex Diaz and John Wrightson. 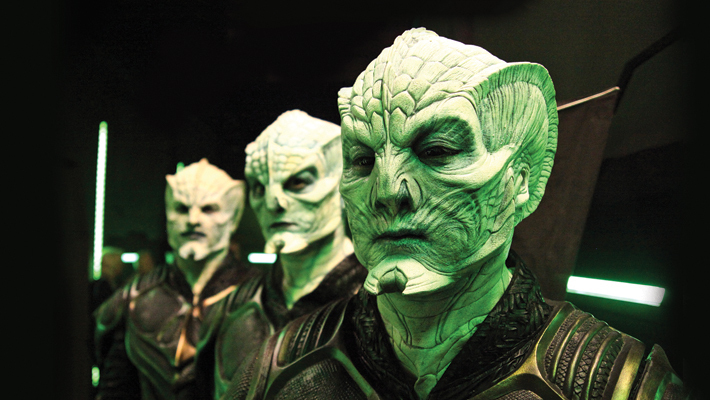 They were charged with the task to take the approved artwork and bring them to life in clay, starting with the bad guys, the Krill, to Chief of Security Alara, to an assortment of alien crew members. 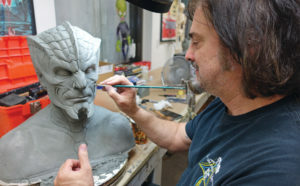 Once completed, the sculptures were moved onto mold makers Mike Ross and Steve Frakes. All molds on the show are syntactic urethane, as we knew there would be hundreds of foam runs out of these molds and stone was not going to cut it. Derek Krout and his team in the Prosthetic Manufacturing Dept. worked 24/7 for months. More than 5,000 foam appliances were produced for the season, including 111 Krill make-ups shot in an eight-day period for one episode. Crazy!!! We began filming the pilot at 20th Century Fox Studios in January 2017 under the helm of maverick director Jon Favreau. Since we were filming in Los Angeles, we could pick from the cream of the crop of make-up artists and hair stylists. In the 15 days of shooting, we employed 13 amazing Local 706 make-up artists. Maxine Morris, Department Head Hair, hired eight outstanding 706 stylists. Aside from the huge number of aliens aboard the ship and visiting civilizations, we had our main cast. 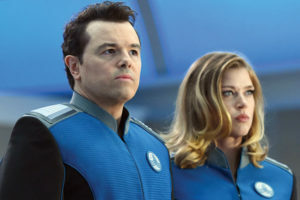 Seth MacFarlane plays Capt. Ed Mercer—Tami Lane, key make-up artist, handled his make-up and hair. The lovely Adrianne Palicki is Cmdr. Kelly Grayson, and Halston Sage plays Lt. Alara Kitan. Both actresses were handled by Suzy Diaz for the pilot. 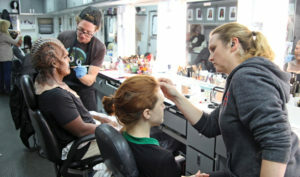 Then Toni G for episodes 2-9 and the remaining episodes, Jacenda Burkett took over the make-up chores. Halston was a combination of prosthetic and beauty. Tami Lane handled the application of her silicone prosthetic ears, forehead and nose pieces. When Toni G took over, she gave Alara a cool and hip retro feel about her make-up, focusing on her eyes and lips. 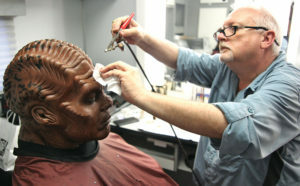 If you notice, Alara’s entire make-up changed from the pilot to episode two. Seth and I decided we wanted to see more of Halston, so Garrett Immel resculptured her prosthetics to allow her to emote more freely then she had in the pilot. At first, I was not that happy with the decision as we had spent so much time designing her look, but in the end, I dig the make-up a lot and glad we made the change. 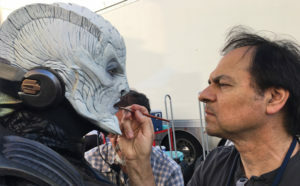 Bortus, played by Peter Macon, was probably the biggest challenge, as it took a while to find his look. I ended up one day going to Seth’s office with Peter’s life cast, my sculpting tools and a block of clay and knock out half a head in front of Seth until we were both happy that it did not look like “a dude in make-up” as he put it. Garrett Immel took my very rough sculpt and made sense of it. Garrett spearheaded the entire look of all the Moclan, which turned out great. We knew that Peter would be working quite a bit. I think Garrett applied that make-up close to 70 times. So, we decided to make things as easy as we could. 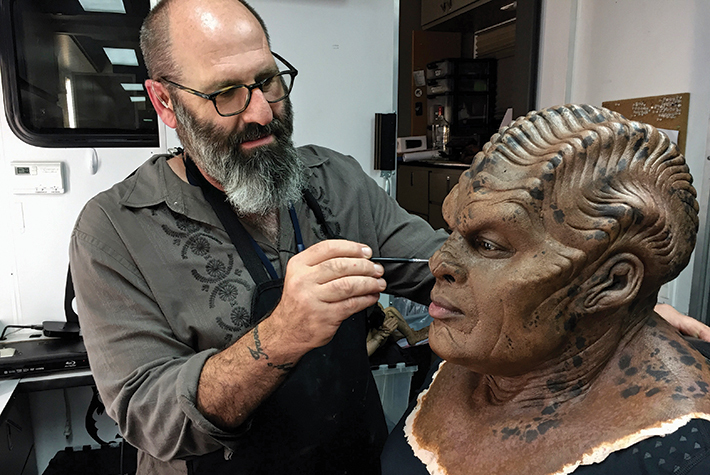 Bortus consisted of a full head and shoulder cowl, chin and lone ranger forehead/cheeks and nose. We kept Peter’s mouth area clear to avoid prosthetic breakdown throughout the long shoot days, as well as not obstruct his speech, which is very important to Seth as he did not want to ADR every line. Scott Grimes and J. Lee play Lt. Gordon Malloy and Lt. John LaMarr. Both simple straight make-ups I covered for the shoot. Lastly, Penny Johnson Jerald plays Dr. Claire Finn, and Tami Lane handled her look. Maxine Morris: Regarding the hair department, this was a far different project than anything I have ever done before and having Howard as a teacher was an amazing experience. I pulled together a great department. In the beginning and the pilot, Seth had wanted all our background very simple but after the pilot, I changed it up slightly and started giving them more detailed hair styles to look more uniformed. Starting with Adrianne, I took her through a wide array of styles starting with a curled, more set look, more like Veronica Lake than a straight sleek look that Seth favored. With Penny, we started with a short taper at the neck with no-bangs wig and a flip on 1 side, and added a vibrant green extension to tie in with her uniform. After a few episodes, we decided to go longer with bangs and always kept the green extension as continuity to her character. Halston’s wig was designed by Howard and built by Khanh Trance at KNB EFX per his design. Her look went through a few changes before the pilot as light streaks were added and her hairline was more of an inverted widows peak. 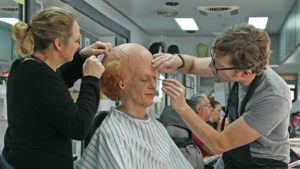 More lace and hair were added to the sides to accommodate the hair being dressed in front and behind the prosthetic ears. 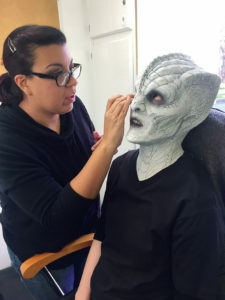 This was my first experience working with full make-up prosthetics and all my other shows have been very basic in comparison, a lot of cop shows and contemporary hair styles. 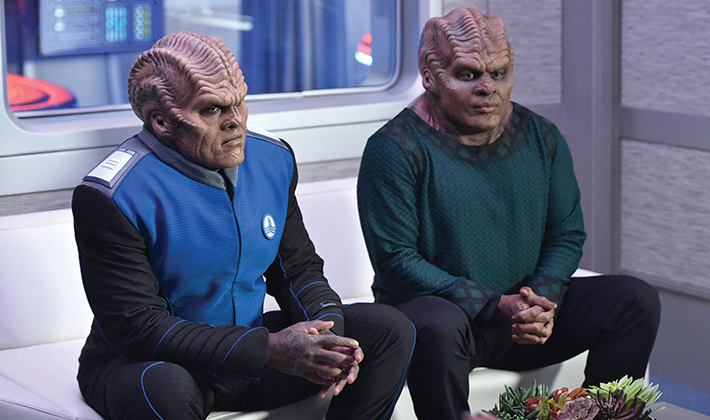 The Orville was a wonderful experience and I couldn’t have done this without my department. Key hair stylist and longtime friend Maggie Hayes Jackson was my right and left arm. 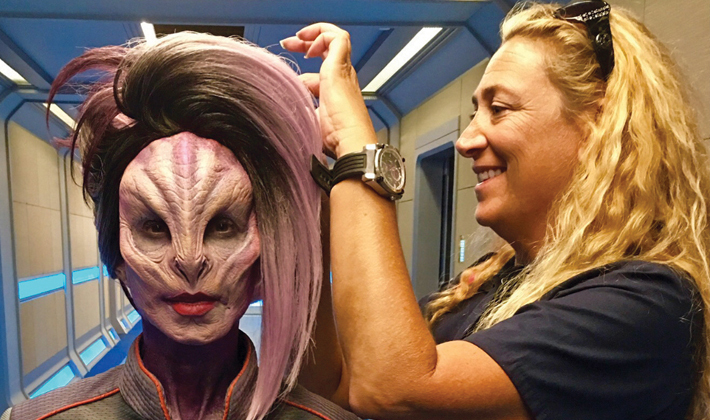 We would sit and designs hair styles for our alien crew members all day long. Maggie’s vision and experience is beyond anything I could have hoped for. Arturo Rojas had his hands full with dealing with Halston and her double Selkie Holm. Most of the time we would have two Alara’s on set during fight scenes so the upkeep was plentiful. After Arturo left, I was beyond happy to be introduced to Kristen Saia, who dealt with Alara wig and multiple doubles without missing a beat. She then became key when Maggie had to depart. 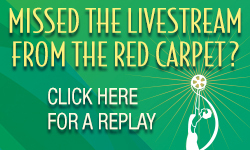 Katherine Rees and Ann Marie Luddy came in as the fourth and did amazing job covering for whatever we needed. I couldn’t have done it without my other day players: Kimberly Beaird Pennell, Brent Keene, Jason Orion, Monica Devinti, Darrell Fielder, Lauren Ernsdorf, Kristine Tack and Lori Sanders. 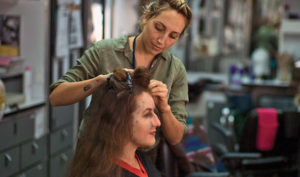 Berger: With each episode being only eight days, make-up and hair worked as a team. As the great Dan Stiepeke had taught me years ago, “We all work under the same umbrella. My success is your success, and my failure is your failure.” I live by these words and echo it every time I start a new show. It is important to me we all communicate and stay on the same page. This keeps drama, egos and attitudes at bay, the way it should be. Production views our departments as part of the team and not that annoying gnat they want to swat away whenever there is an issue. It’s the best and only way to run a department. OK, enough preaching—onto the behind-the-scenes stuff. Most of all the big make-ups were three pieces; a cowl, chin and the lone ranger piece. We also opted for foam latex over silicone due to weight, the amount of time to run everything at KNB, and foam allows the artist to mix match pieces on BG actors more easily then silicone. Plus, I like foam, it’s old school and I like old school. We also did a lot of make-ups with rubber mask grease paint and I like to use duo to blend pieces. It’s funny that we forget the ways and techniques we utilized as new products hit the market. We think because it’s new it’s better but that’s not always the case. I like the older methods, things I learned from others and then re-vamper to suit the way I personally do things. I would push the make-up artists to do their make-ups the way they felt comfortable doing their make-ups each day. Craig Reardon loves aqua color and uses it almost exclusively. Garrett likes PAX paint, I like RMG. I say there are 100 ways to make a hamburger, but at the end of the day, it’s still a hamburger. The same goes for make-up. There are hundreds of ways to do something but if one way works better for you than the other, go with it. It’s not a connect-the-dot situation. It’s about being creative and enjoying the process. As always, we like to give credit where credit is due. We are only as strong as our weakest link, and luckily, we had very strong links. Maxine had brought in Katherine Rees, Kimberly Beaird, Jason Orion and Ann Marie Luddy to round out the hair department. I was blessed to get the all-stars of make-up in, from Stephen Prouty, Todd McIntosh, Christopher Nelson, Greg Funk, Kevin Haney, Craig Reardon, Gerald Quist, Peter Montagna, Kevin Wasner, Steven Anderson, Ralis Kahn, Carlton Coleman, Chloe Sens, David Dupuis, Bruce Fuller, Brandi Kjarsgard, Karrieann Sillay, Greg Nelson, Jamie Kelman, Alex Noble, Jason Collins, Mike Mekash, Amanda Benzaken, Ron Pipes, Jennifer Essex, Karen Iverson and Cary Ayres to name a few. Maxine and I felt so lucky to have such a supportive bunch of talented Local 706 members who were there to do their best and have fun at the same time, which to me is the best part of doing this, the fun!! 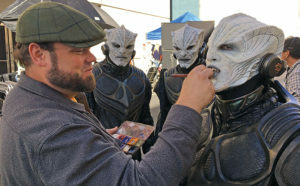 In all, we created more than 100 species, applied close to 5,000 prosthetic make-ups, went through gallons of prosthetic adhesive and removers, worked thousands of hours and can’t wait to do it again for season two!!! It was truly a great adventure and we are all thankful we get to do this for a living. 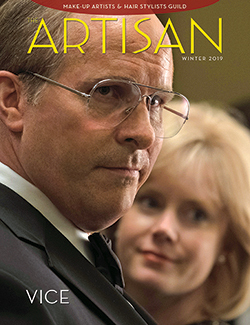 It’s a great joy and honor to be part of this amazing industry and I am thankful every day that I get to keep learning from my fellow artists and Local 706 members. Just when you think you know something, there is always another way to make a hamburger.